Today it’s two February French Fridays (on a Sunday) for the price of one. Yeah, I’m running a little behind this month. 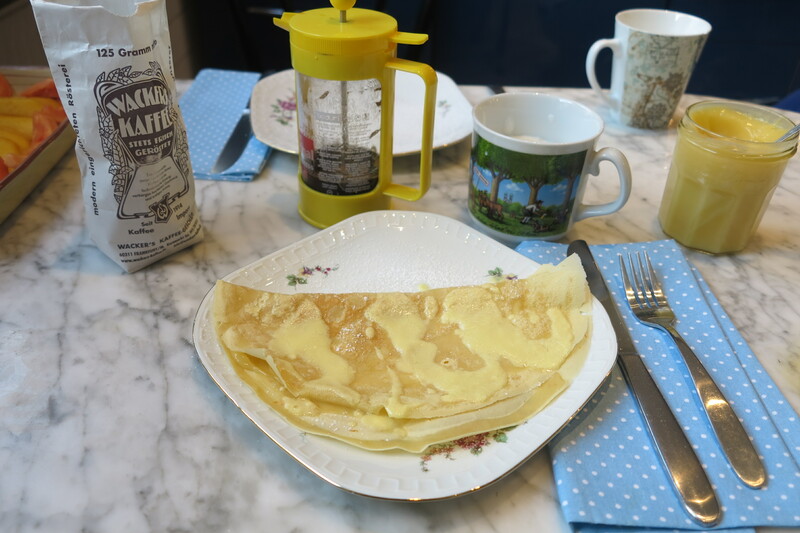 First up, this past week’s recipe, Butter and rum Crepes. Now, maybe it’s the Vermonter in me, but I’m a bit of a purist when it comes to pancakes. Butter and maple syrup is the gold standard (real maple syrup in case there was ever any question). I occasionally enjoy nuts or fresh fruit thrown into the mix. 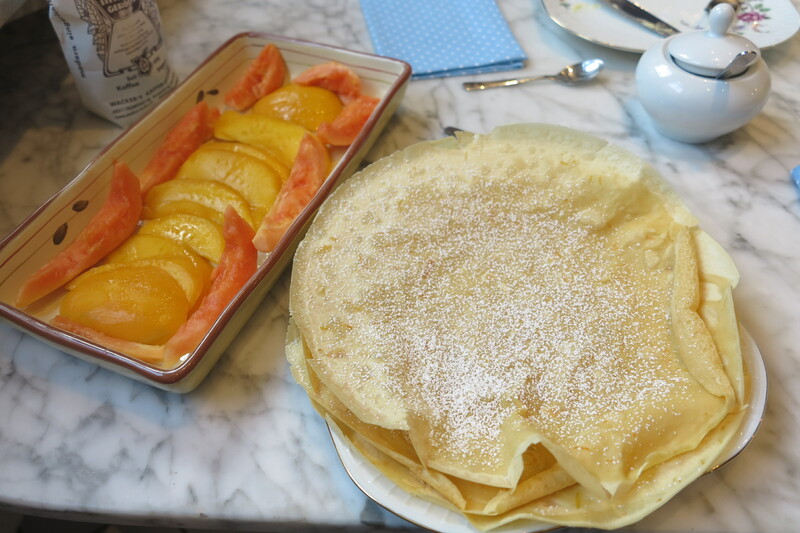 And my favorite crepe topping is sugar and fresh lemon juice. It may not stand out to you when reviewing the menu at a crepe stand (my husband usually goes for nutella), but I assure you that it’s delicious. All of those fussed up custard filled this and chocolate & ice cream topped that, doesn’t interest me at all. It’s breakfast, not a bloody ice cream sundae. So, rum crepes filled with lemon curd and topped with a citrus butter sauce? Sounded a little fussy to me. And it was. Especially to make. But the lemon curd was a big hit. I wasn’t a big fan of it on my crepes. But I absolutely LOVED it mixed into my yogurt. That I will make again. The crepes and the sauce, not so much. Next, a recipe from earlier in the month, Boeuf a la Ficelle, or Beef on a String. A classic example of how just about anything sounds fancier in French. I mean, who is going to order “beef on a string” off of a restaurant menu? The prep for this one made the crepes look easy by comparison. First we had to make our own beef broth. Mine was a bit bland because my bones didn’t have much marrow in them and I had to beef it up a bit (no pun intended) with some demi glace. Next time I’ll either pay closer attention or take the lazy route and buy some at the store. 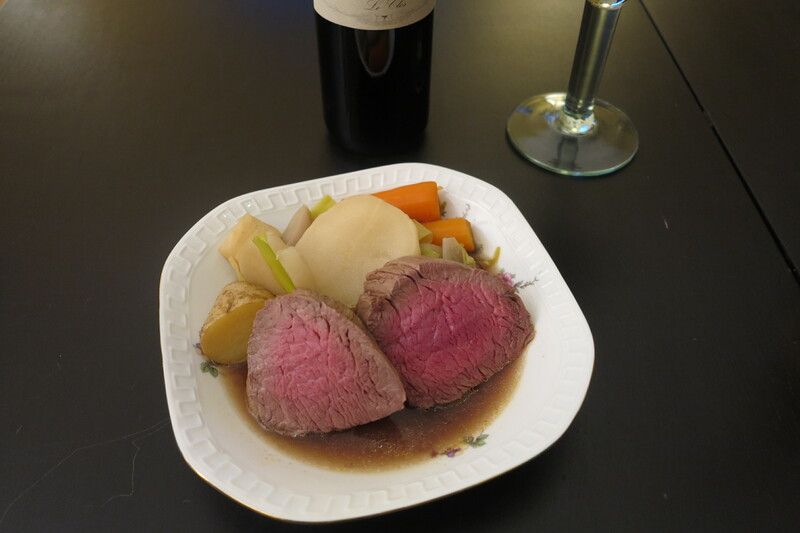 Next, we cooked a pile of veggies and finally a full beef tenderloin in the broth. The whole idea sounded weird. Really weird. But it didn’t taste weird. It tasted delicious! The meat was perfectly done and the veggies and broth rounded out the meal nicely. We enjoyed the leftovers the second day and then on the third day I made Dorie’s Next-Day Beef Salad. Also delicious! Looking forward to making that one again when it comes up on the FFwD roster. Yes, the sauce was not the greatest but I loved the crepes. The beef on a string looks good – totally agree that it sounds weird, but tasted great. and this was something we enjoyed too. I’m with you Nana, I like the simple toppings better too. You really have been busy!! Great make up…the beef on a string was well received in my house. Sorry the crepes were not a hit for you…I’ve already made them three times in the last 2 weeks. We love crepes in our house! Enjoy your week, Rose! Very smart to make the next day beef salad too 🙂 That beef dish was a little fussy, but delicious. I don’t think lemon curd could be a bad idea anywhere – I like the thought of it mixed in yogurt. I’m glad the beef on a string was a pleasant surprise. We enjoyed it too. I somehow missed the next-day beef salad. That sounds yummy. Sorry the crepes weren’t your favorite. I’m embarrassed to admit that I don’t like maple syrup, at least not on pancakes. I hope we can still be friends. I’m sorry you weren’t a big fan of the crepes or the sauce. After reading everybody else’s posts I’m really regretting not making the lemon curd… What kinds of fruit are in your top photo? Grapefruit and mango? We picked up a mango and mini papaya. The mango was perfect but the papaya probably needed a bit more time to rippen. I made the lemon curd last night and it was delish! Love that you made a twofer – enjoyed that beef on the string too! I lucked into a bag of Meyer lemons (they aren’t always on offer here and when they are, they’re often a ridiculous price), so I made the lemon curd, too. It was fantastic, both in the crepes and with, well, everything else we could think of. I think my Quebecker grandfather would have approved of your pancake purity. He was a maple syrup man all the way. Your Boeuf a la Ficelle turned out beautifully, too. I’m posting that one tomorrow, in place of the garbure. The crepes were best with just some powdered sugar and/or a little caramel drizzle. Simple is always better.